Ambrose and Rose Campo probably never imagined that the little grocery store, and butcher shop they based their lives on in 1947 would still be here almost 70 years later… successful, growing, and continuing the traditions and values on which their future flourished. 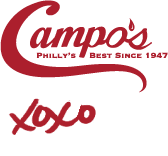 Campo’s Philly favorite cheesesteaks, and hoagies come straight from their legacy, of quality, family, neighborhood, hard work and devotion, and from the one ingredient crucial to their success and ours: Personal service or as we like to call it “love” It has kept our customers coming back since we, the next generation took over in 1975. We grew up in the food and deli business, and we learned that the most important thing we can do is to put the customer first. We work hard to give you that extra special attention you deserve. We pay close attention to the details, and the results are exceptional. When Mike Campo says, “That’s not just a sandwich, that’s someone’s meal! Make it great!”, it comes from his heart. Our business is more than just hoagies, cheesesteaks and sandwiches. It’s personal…and it shows. So, when you order any of our extra special foods that we make here in our Philadelphia kitchen, you’ll discover that, just like Ambrose and Rose, we don’t let anything leave without a little “love” in it.